Bar-Kays: Where Are They Now? Back row, from left to right: Charles Allen, Frank Thompson, Winston Stewart, James Alexander, Michael Beard and Harvey Henderson. Front row, left to right: Lloyd Smith, Larry Dodson, Sherman Guy and Mark Bynum. Special thanks to Cynthia, Winston Stewart's ex-wife, for the 2003 updated info on Winston Stewart and Harvey Henderson. 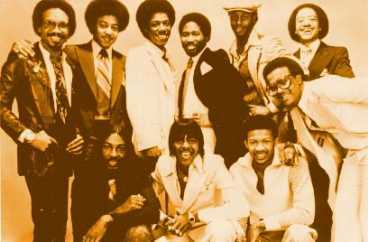 "The Bar-Kays's Road Manager known as 'Big Zek' passed away last year (2002) from leukemia. Zeke was famous for his line 'COME ON YALL, IT'S SHOW TIME'. " Still active in the Bar-Kays. Lives in Memphis with wife and children. Lives in Albuquerque, New Mexico. Does concert promotions and is the manager of a large department chain. Possibly K-Mart. Is playing in a local band in Columbus, Ohio where he lives. Has a studio in his Memphis home and is pursuing a singing career of his own, as well as writing, recording and producing for other artists, independently. Active in a vocal group in Memphis, where he lives. Owns a construction company. The Shelby County Circuit Courts Office in Memphis, where he lives with wife and children. Lives in Memphis. Winston is managing his 14 year old twin sons Jon and Noah who have a Gospel-Jazz band. Winston is still co-active with the Bar-Kays and is the minister of music for his church. Played with Cameo for a year and a half and also played with Clarence Clemons. Frank is residing in Tampa, Florida. As of fall 2002, he is working on a smooth Jazz CD entitled, "Frankly Speaking", which should be released late fall of 2002 or Spring 2003. � Maria Granditsky September 1996.